It’s been a week since my last post. While I haven’t logged much computer time, we’ve been busy out on site, and have the progress to prove it. While I’ve been off of work for the past month playing construction guy, that changed today and it was back to a warm office. To call the change a shock to the system would be an understatement. Even getting dressed this morning was weird. I put on my suit pants and the only thing I could think of is how flimsy they were. But I digress. Again. The house looks…well it’s hard to describe how amazing it looks. The soffit is complete, the interior framing is well underway, we’re about halfway through staining/sealing the many exterior glulams and my father continues to crank away at our cabinets, among other things. 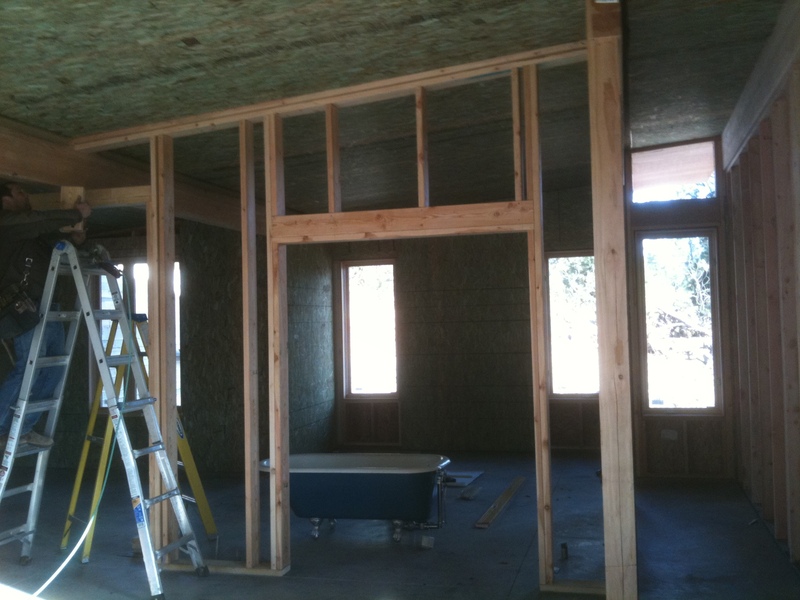 The interior framing is transforming our space in pretty fundamental ways. Suddenly the long site lines are apparent. Rooms now have scale. And the air is littered with the phrase “damn, that looks cool.” Even cooler? The next few days promise even more transformation. Bit of a photo dump below, so I’ll let the captions tell the story. A forklift with a load of lumber. Sure sign of progress. I hadn’t used this kind of jack before. Pretty cool. It was a heavy beam though–heavy enough to bend a metal bar we used on the jack. L was helpful gathering nails on her spring break. Our daughter gets to do cool stuff with high potential for injury. Sweet! I had to include this photo. I don’t know what the hell McSpadden was doing. Nope Mom didn’t like the picture. But I’ve just about picked up all of the pieces of my stomach! The house looks great.